Is your Property Protected against Termites? Termites play a key role in the ecosystem, as they break down and recycle nutrients from decaying plant matter. However, when they enter our home or business they can cause devastating damage. Termites pose a significant threat to any property, because they live and thrive inside wooden structures with very few signs of damage on the surface. 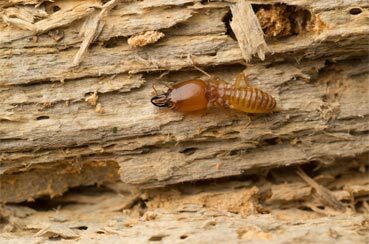 Termites feed for 24 hours a day without sleeping and have been found to forage as far as 100 metres from their colony. Their small size, large numbers and eating power make early detection and preventative measures an important part of protecting your home or business. 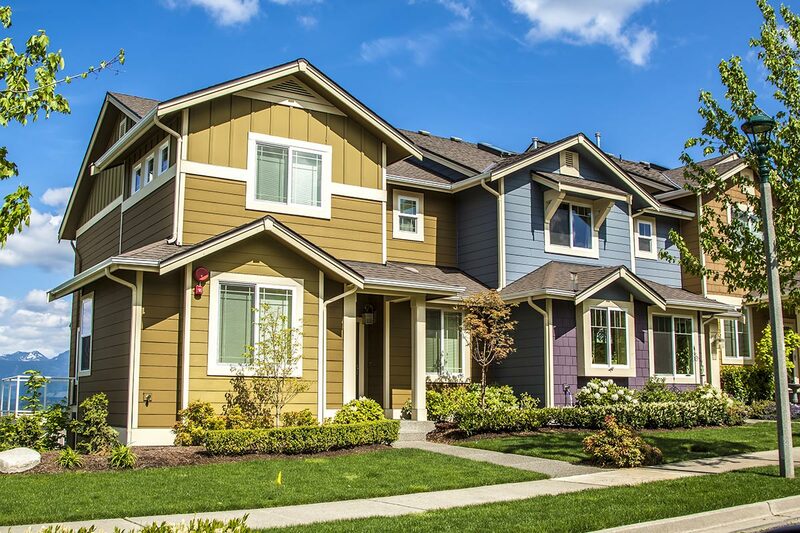 Depending on whether you are planning on a new property or want to protect an existing building, we have the right treatment to meet your needs. Our termite treatments come with 1 – 5 year warranties, depending on which service you choose. 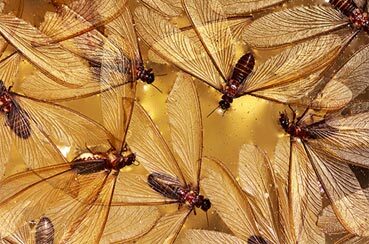 If termites return to your property within the warranty period, we will return free of charge to treat the reinfestation. This is the most obvious sign that you have termites. 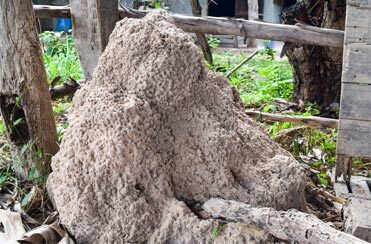 Termite mounds can usually be found around the base or foundation of a food source, such as a dead branch or tree trunk. Termites create channels, called galleries, within the wood, as they consume the wood from the inside out. These channels commonly leave the outside of the wood still in place, but form a cavity behind the usually paper thin exterior. These galleries can be located by knocking on the wood to see if it sounds hollow. Alates are mature termites leaving the colony to mate and start new colonies. Depending on the species, they usually leave the colony just once or twice a year. Given the infrequent and brief nature of this emergence, it often goes unnoticed, as, after mating, the termite alates quickly shed their pair of wings. However, their discarded wings are often seen in cobwebs, on outdoor surfaces near foundations and on windowsills. 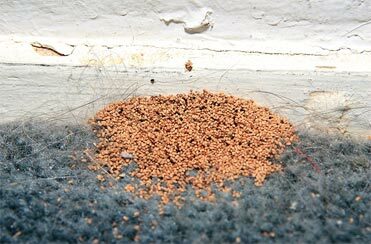 When dry wood termites consume wood, they excrete droppings or small faecal mounds, which are usually located near the infestation. If subterranean termites cannot access wooden structures directly, they will commonly build mud tubes over foundations or walls, to give them direct access. These mud tubes are around the width of a pencil and are built out of tiny particles of mud or debris and are used as a protective shell against light and potential predators. Another sign is small cracks in wooden structures being filled with mud particles, as termite galleries are probably hidden underneath. reasons why your property might be more susceptible to a termite invasion. Flowers and shrubs near your foundations: Ensure that vegetation, such as flowers and bushes, are at least 25cm away from your foundation walls, as decaying vegetation is a food source for termites. Furthermore, termites can easily use vegetation as cover, so they can gain access to your home unnoticed. Trees and bushes: If a tree branch is touching your roof or wall, then termites can use this as a 'bridge' to access your home. To protect your home, ensure that no branches or bushes come into close contact with your property. Leaking Taps/Pipes and Air Conditioning Units: Termites are attracted to moisture in the soil, make sure that any leaking taps or pipes are quickly fixed and that the outflow from AC units doesn't drip directly onto the soil near your foundations. Broken Roof Tiles and Guttering: If you have any broken tiles, then these can create moisture in your roof, which will attract termites. Broken or leaking guttering can not only drip onto the soil, attracting termites, but can also become breeding sites for mosquitoes, if they become damaged or blocked with debris. Regularly check your roof and guttering and repair when necessary. Debris and Wood Piles: Unused items and debris stacked up against your property's walls, such as wood piles, can give termites cover, as well as create an attractive moist environment and even a food source for termites. Remove all debris and wood piles away from your walls and foundations. 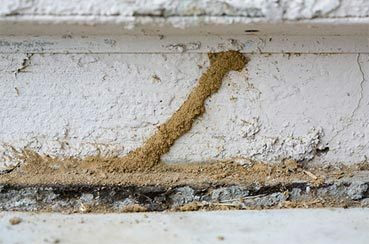 Cracks in Foundations: Cracks and damage in your foundations and walls can give termites easy access to your home. Regularly check the base of your walls and your property's foundations for any cracks and repair them immediately. Garden Fencing or Patios: Wooden fencing and wooden patios can be a very attractive source for termites and a springboard for invading your home. Regularly check all wooden fencing and patios for any termite activity and ensure they are treated professionally as soon as possible.